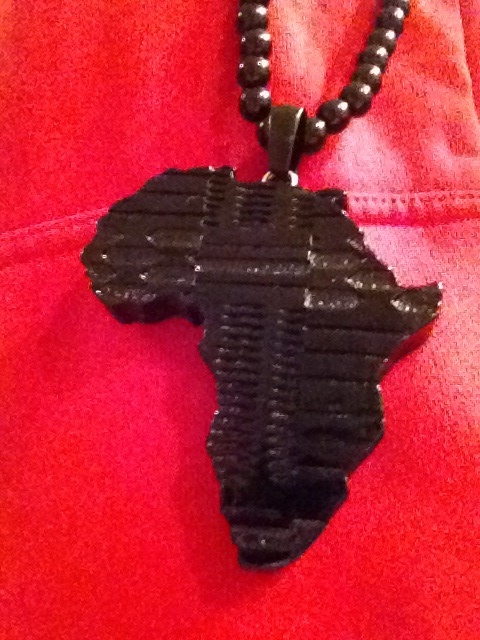 I’ve started to dream about Africa. In April, I’ll be launching an opera festival in the heart of Botswana. That’s my new year’s resolution for 2013! But organizing a festival takes a lot of mental energy. I think about it constantly. I talk about it. I even dream about it. I have Botswana on the brain, and I haven’t even been there yet. The No. 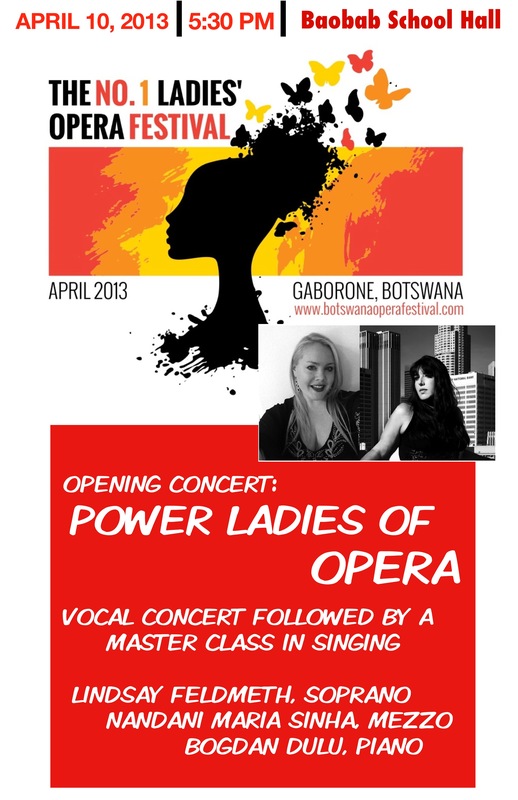 1 Ladies’ Opera Festival was inspired by a talented group of opera singers in Gaborone, Botswana. These dynamic singers are doing exciting work and producing some very original opera. But it’s hard to sustain an opera company in Southern Africa, and due to financial problems, they have just lost their opera house. We will also have the privilege of working with some AIDS orphans in Gaborone, and giving them a music workshop. This was an unexpected opportunity that suddenly presented itself a few weeks ago. One of the most important things that I learned in 2012 is that it’s impossible to predict how things are going to happen! Things just don’t go according to plan. It’s hard for overachievers to accept, but there are circumstances beyond our control. And that’s not such a bad thing. I have never been to Africa. But that’s about to change. In April, I’ll be heading to Botswana to launch the No. 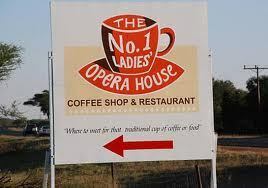 1 Ladies Opera Festival! If that title sounds familiar, then you have probably read the best-selling mystery series about the No 1 Ladies’ Detective Agency by Alexander McCall Smith. 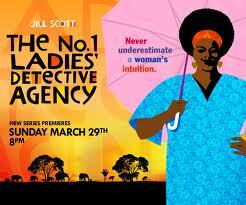 Or maybe you caught the brilliant HBO series by the same name, with superstar Jill Scott in the role of Precious Ramotswe, the best detective in Botswana. But you may not be aware that Alexander McCall Smith also founded an opera house in Botswana’s capital city, Gaborone, called the No. 1 Ladies’ Opera House. He established the opera house together with his friend David Slater, a marvelous musician who has been at the center of Gaborone’s classical music scene for more than thirty years. They assembled some talented singers and began to sell tickets. My connection to Botswana is through my friend Karen Torjesen, professor of Women’s Studies at Claremont Graduate School, who is also a frequent guest professor at the University of Botswana. One day last year, Karen was filling out paperwork at the university when she suddenly heard a beautiful soprano voice singing classical music! It turned out that the young woman handling Karen’s work permit was an opera singer, a student of David Slater’s. Karen told her about the workshops I teach for young professional singers and my recent festival in Nepal. The young soprano was delighted, and several e-mails later, I was asking David Slater if his singers would like to have their own opera festival. He said yes. And that’s how the No. 1 Ladies’ Opera Festival was born. Over the next few months, this captivating little idea began to gain momentum with breathtaking speed. I was delighted when the award-winning pianist Bogdan Dulu accepted my invitation to perform with me in Gaborone. And then the fabulous mezzo-soprano Nandani Maria Sinha told me she was available to go to Africa, as well! 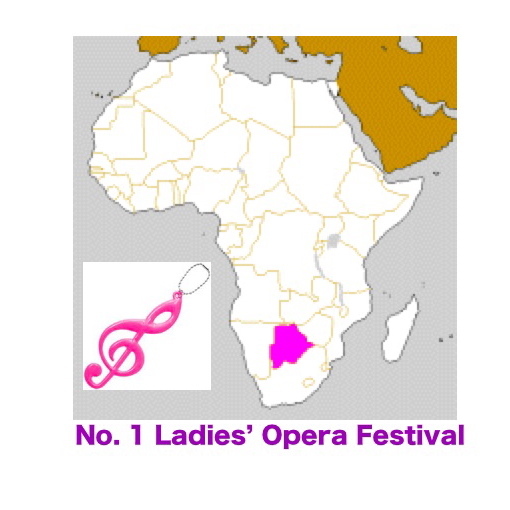 In fact, we are planning to give concerts on the theme of “Powerful Women in Opera” in Namibia and South Africa as well as Botswana! 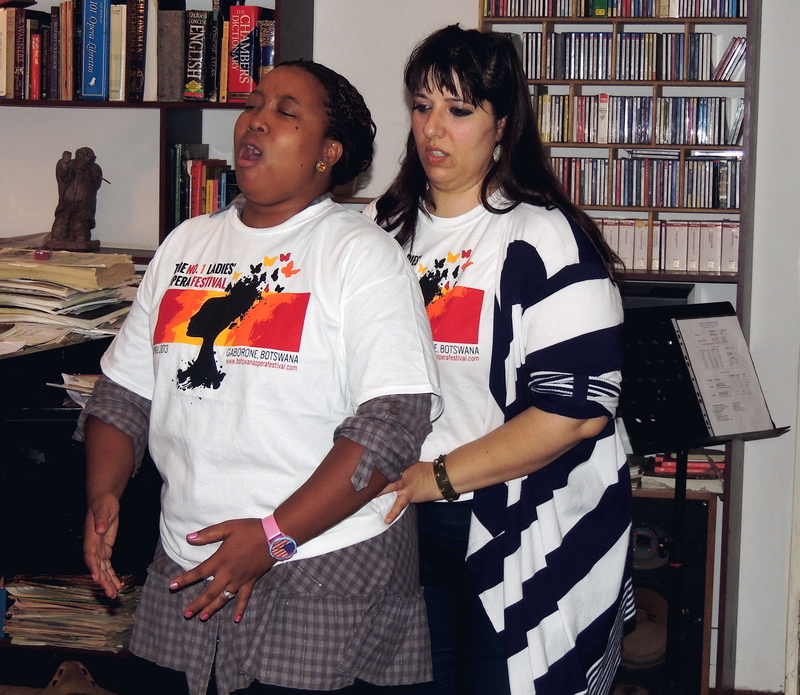 We will also teach workshops for the singers in Gaborone, and organize some exciting concerts for them. So the festival will feature performances by both local and international artists, as well as workshops in vocal technique and operatic repertoire. It will culminate in an energetic closing ceremony including both classical and traditional music. By a happy coincidence, we will be there at the time of the Maitisong Festival, Botswana’s largest arts festival, so we’ll get to experience Southern African music like never before! And we’ll get it all on film. I’ve asked the filmmaker Heidi Burkey to create a special documentary about this festival. These young singers are already following their dream of being professional opera singers, but they face enormous odds. 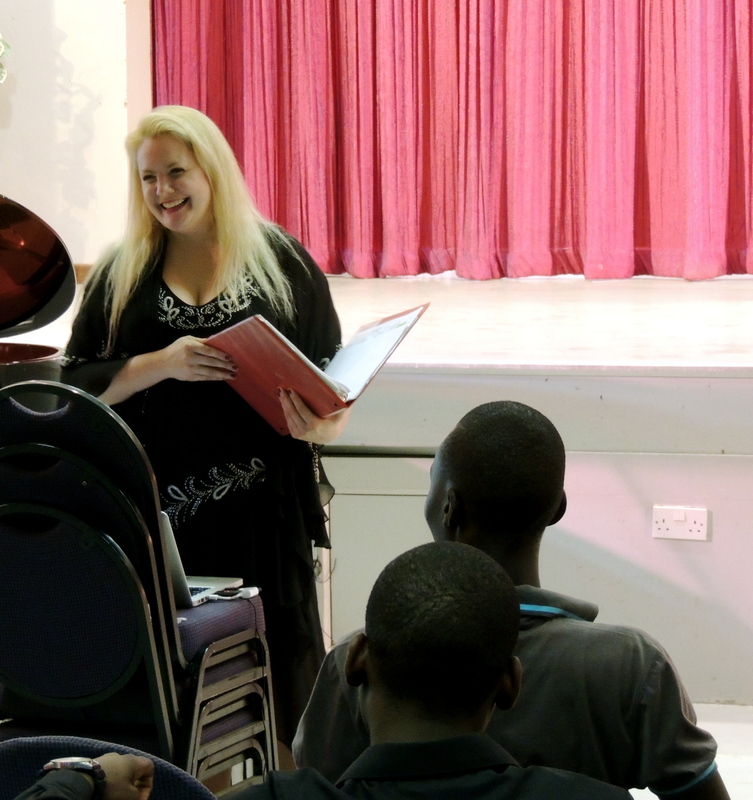 It is hard to sustain an opera career in any part of the world, but it’s even harder in Botswana, and it would be so easy for these talented artists to feel isolated and discouraged. So we want to help them use media channels to gain real traction for their careers. We’ll be spreading their music across the world. The goal of the festival is to equip and inspire emerging artists in Southern Africa while bringing attention to women’s issues through musical performance. We also hope to cultivate sustainable funding sources for local arts programs in Botswana. We are thrilled to collaborate with Claremont Graduate School, David Slater Music, the No. 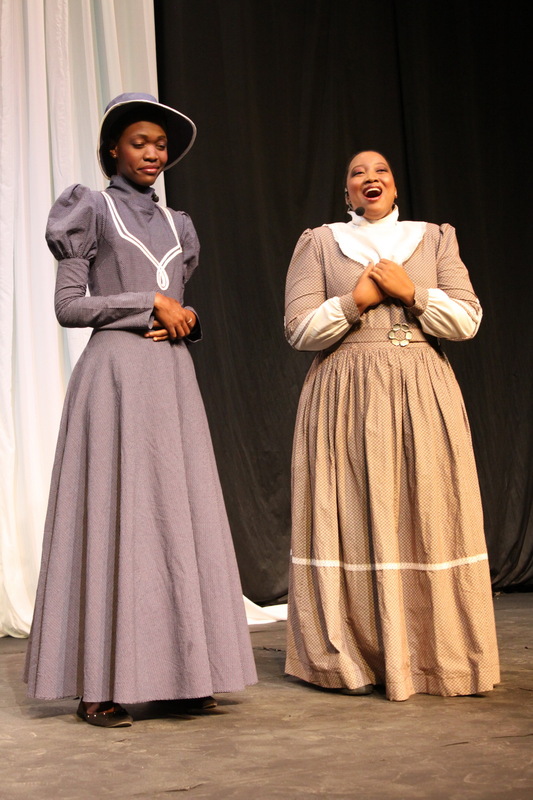 1 Ladies’ Opera House and the Maitisong Festival to create an exciting new cultural event in Gaborone. To raise money for this exciting event, I’ll be organizing a series of benefit concerts and one complete opera production in Los Angeles, so stay tuned for more details! In future blog posts, I’ll tell you even more about this wonderful group of singers in Botswana. We do need help to fund this festival, so if you are able to make a donation, please donate here. Every little bit helps! Let’s make this happen.